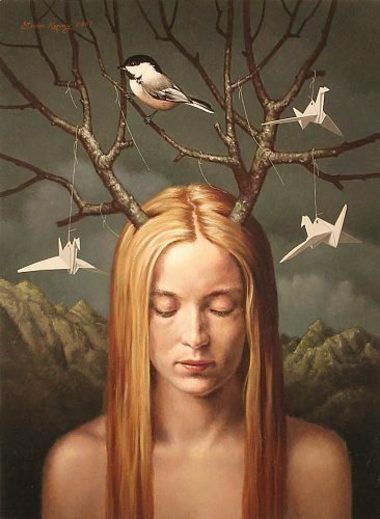 Steven Kenny was born in 1962 in Peerskill, New York, and studied at the Rhode Island School of Design, with a European Honors Program year abroad in Rome. His work has been exhibited in galleries and museums across the U.S. and Europe. 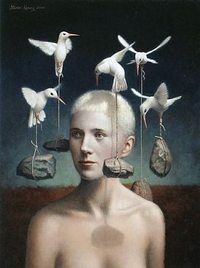 Recent shows include Dreamland: American Explorations into Surrealism in Santa Barbara, California, and Venus and the Female Intuition in Denmark, the Netherlands, and France. Kenny's passion for myth, folklore, and the numinous world of nature is eloquently expressed in his remarkable paintings, which are also works of activism aimed at awakening us to our responsibilities to the planet we co-inhabit. "We humans are inclined to forget or ignore the principles of existence," the artist says. "They include: every action directly impacts our environment, change is unavoidable, stasis is unnatural, time is beyond our influence, conception is the commencement of death as well as life, and many others. Our challenge is to humbly accept Nature's gifts and live by the lessons set before us without imposing our arrogant will upon each other and the planet. "As humans more fully embrace technology we feel an increasing sense of anxiety, disorientation and fear. To compensate, our desire for predictability and order ignites a voracious hunger for control that induces us to force Nature to relinquish her secrets. Once a trusted provider, she is now viewed as 'shifty,' inadequate, and needing improvement. We manipulate our surroundings in an attempt to manage time, eliminate unforeseen change, and establish a permanent sense of stability. We go to great lengths to surround ourselves with psychological, physical, spiritual, social, and cultural environments that we hope will last. The result is an increasingly artificial existence. “'World peace,' he replied, then smiled and waited for the next question, as if there were nothing more to say." Read the full article, "Land, Farmer, Community: A Sacred Trust," on Orion Magazine's website. And while you're there, don't miss the gorgeous poem "Boundaries" by the great Mary Oliver in the same issue. The archive of past issues holds such gems as "Small Wonder" by Barbara Kingsolver (an essay reflecting on miracles, myth, and the nature of war), "The Naturalist" by Barry Lopez (discussing the importance of sitting quietly by a river), "Tumult of Vision" by David Abram (introducing the beautiful photographs of Mathew Chase-Daniel), and a lovely little essay on the humble tortilla by Rebecca Allen. The painting above is "Seed Saver" by Steven Kenny. Author Barth Anderson (who also works as a manager at Minneapolis' premier organic grocery co-op, The Wedge) alerted me to the growing movement by individuals, co-ops, and even chain organic grocery stores to offer relief and support for the Midwest organic farmers who saw their crops literally washed away in the flooding that occurred throughout much of the Midwest states this last August. Sow the Seeds Fund has created a useful website for information for farmers seeking relief assistance and for individuals and corporations wishing to donate, as well as a list of co-ops. The site also offers a list of grocery stores in the Midwest (and across the US) that are participating in the assistance programs. Gretta Wing Miller has produced a short film on the flooding, which you can see here. And here's a short video of Barth Anderson on Showcase Minnesota discussing the flood and its impact. Author O. R. Melling sent me this information on the recent protests to stop the development of a motorway through the Tara Valley, one of the oldest sacred sites in Ireland (and the setting for her novels in the Fairie Chronicles series). 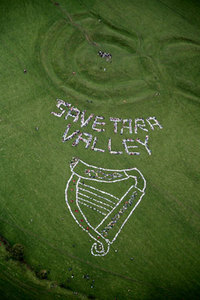 "Here are some pics of the two truly mythic protests that took place this weekend in Ireland against the M3 motorway which is ploughing through the sacred valley of Tara. Raths and other ancient sites have already been destroyed with National Road Authority archaeologists insisting they have 'recorded everything.' Tara is now on the World Monument Fund's list of 100 most endangered sites. "The EU is investigating the matter under destruction of world heritage but the Irish government is trying to rush through the motorway before it can be outlawed. If the motorway goes through, the noise of traffic density will overwhelm what is now a still, green, and sacred beautiful place; plus the inevitable development that will accompany the motorway will destroy the landscape entirely. 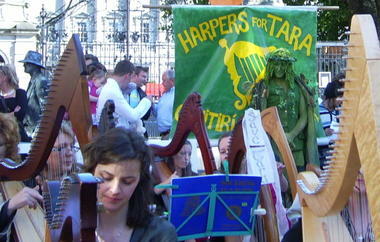 "First protest: harpers from all over gathered before the Dáil (government buildings) on Saturday, September 22, to play The Harp That Once Thro' Tara's Hall (by Thomas Moore) to voice their protest. 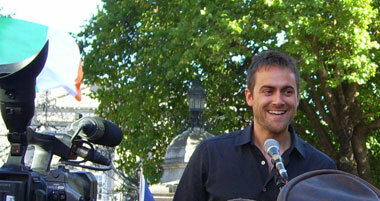 The Green Man was there and also Irish actor and Hollywood star, Stuart Townsend, who has been championing the cause for three years. There were additional support protests in Boston, Chicago, and New York. For more information about the campaign (and an opportunity to get involved) visit the Save Tara website. Here's additional information on Feider's company, O2 Sustainability Treehouse, that provides more gorgeous photos and technical drawings. 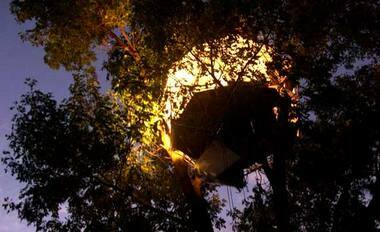 For you techies, here's an article from Popular Mechanics that explains some of the treehouse's remarkable design features. 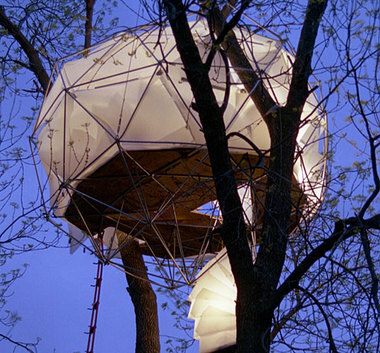 And stop by Feider's website to see the gallery of treehouses and order plans for your own treehouse. Click on the large image at the bottom of the webpage to see a flash presentation. Performance and installation artist Carolyn Ryder Cooley creates "emotionally driven narrative spaces" and modern mythic stories in three-dimensional form for viewers to enter into, experience, and explore. Her work is informed by fantasy and folklore, nature, history, politics, the mystery of abandoned places and found objects, and the secret lives of insects, birds, and animals (especially deer). 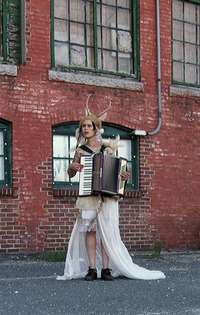 She is an interstitial artist who weaves visual art, performance art and music together as she endeavors "to engage viewers on multi-sensory levels that alter their experience of time and place." Her intent, she says, is to "invent haunted dream worlds that echo political and cultural phenomena of past and present. 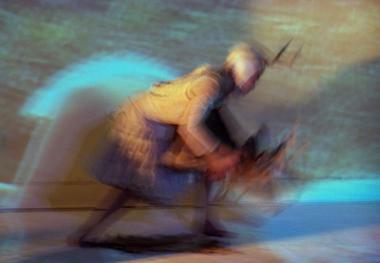 Video, sound and site-specific lighting create an atmosphere of dis-reality. 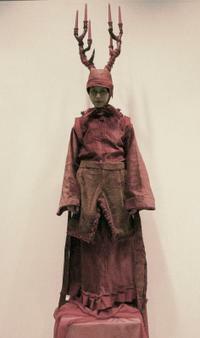 Rescued materials are transformed into props and garments which reveal incomplete evidence of pasts. Emerging from post-industrial waste, pollution and decay, these installation places give refuge to new habitations of marginal hybrid species. Mythical androgen creatures stem from cracks and crevices as drawings and performance characters. Their bodies are often scarred, bandaged and modified through plastic surgeries and transfigurations that abandon notions of gender and identity. By performing improvisationally and collaboratively within these installations, I myself become a Utopian gutter creature." "A chair is suspended from a bridge. 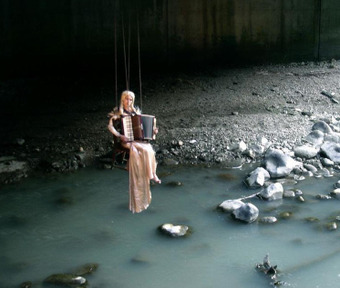 Musical serenades are performed in the chair 10 ft. above a river with cars driving overhead and birds flying around. Performance and chair are viewed through the gallery windows. 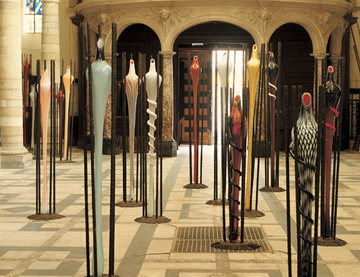 Concurrently, an indoor installation consists of four chairs suspended in individual window wells. One empty window invites a view of the chair outside. Beneath each chair is a nest of rocks collected from the river. During non-performance hours, serenades can be watched on video and the performance gown hangs alongside the video monitor." "The central character, Vigil Deer, is an antlered doe. She is clothed in red, the color of martyrdom and blood as a reminder of the suffering caused by war. 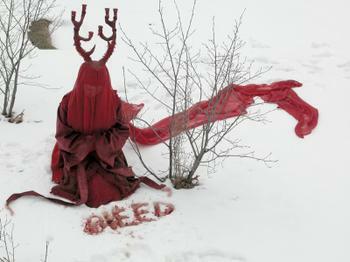 The iconography of this project stemmed from a series of deer encounters during the rutting and hunting season, and the subsequent discovery of a hermaphroditic deer species, known as the Velvet Horns, who live peacefully in alternative communities." You can see a slightly larger version of the video here. And yes, the guy is a genius. Steve Tobin is an artist who has gained increasing prominence in recent years for his iconic sculptures inspired by shapes found in nature and science. 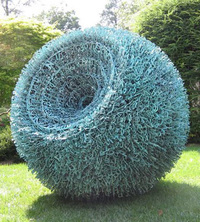 His passion for organic forms is shared by two of my other favorite sculptors, the U.K. artists Andy Goldsworthy and Peter Randall-Page -- but Tobin comes from the U.S. side of the Atlantic. 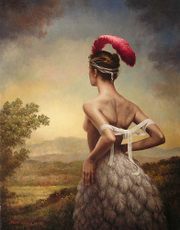 He grew up in the suburbs of Philadephia, and now works out of a busy sculpting studio in Bucks County, Pennsylvania. "With a degree in theoretical mathematics from Tulane University, Tobin is particularly interested in string theory, which proposes that everything in the universe is composed of vibrating loops of energy. In that spirit, he created a spiny organic work he calls Uni, Japanese for sea urchin, out of junked fireworks-launching tubes. The piece appears to be in throbbing motion, like string theory's loops of energy. 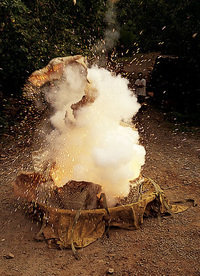 More recently he's been working on 'Exploded Clay' sculptures (made by detonating fireworks in blocks of wet clay), which, at least in theory, pay homage to the Big Bang that most scientists believe created the universe." Working in materials that range from glass and clay to bones and bronze, Tobin creates art, he says, that "comes from my own heartbeat. If my life gets too frenetic, I can't feel my pulse and don't know what I'm doing." 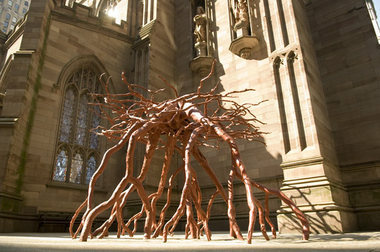 The extraordinary piece at the top of this post is "Trinity Root," a twenty foot high bronze sculpture for Trinity Church in lower Manhattan. It was created from the roots of the historic Sycamore tree that saved St. Paul's Chapel during the World Trade Center attacks on September 11, 2001. 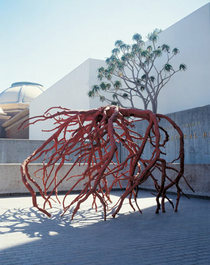 The sculpture to the left, "Walking Roots," was exhibited at the Museum of Natural History in Los Angeles. Regarding these sculptures, Tobin says: "When you walk away from the roots and go on with your life, hopefully the next time you look at a tree, your mind will travel underground and see things not readily apparent. We all have roots. We all have histories. We all have mysteries below the surface." You can see more of Steve Tobin's art, and watch a film about his work process, on his website. Read Amei Wallach's article on Tobin (with photographs by Bill Ballenberg) here. 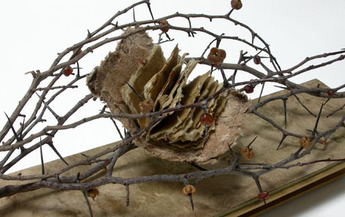 Susan Kapuscinski Gaylord is a book artist whose work has been exhibited and collected across the United States. 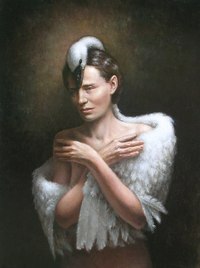 Born in Rahway, New Jersey in 1951, she now lives and works in Newburyport, Massachusetts. Her exquisite Spirit Book Series has a distinctly mythic quality, evoking the spirit of stories told for centuries in both oral and printed forms. 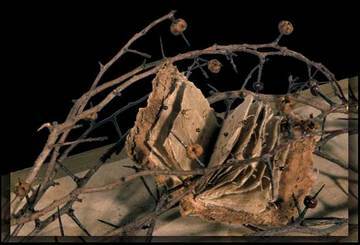 "The Spirit Books bring together my love of the book and my response to the natural world that we see and the invisible one that lies behind it," the artist writes. "...I feel a deep connection to older powers as I gather twigs, branches, vines, and roots. Using them to cradle books, I link them to the longstanding tradition of books as testaments of faith and belief." The book pictured in the paragraph above, for example is called Sacred Speaker. The name "refers to the fan shape, and the original use of folding fans in Japan -- for communication with the gods." The book below is Hope Offering. "The hawthorn is a symbol of hope. In Ireland and Wales, women hang bits of cloth on branches near sacred wells, a custom that was originally an offering to the goddess. Here the hawthorn is embellished with beads and seed pods from the rue plant. 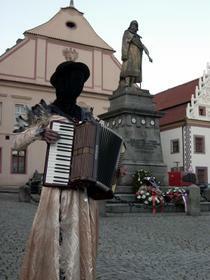 Rue is the symbol of all good things at weddings in Lithuania." In addition to creating these one-of-a-kind books, Gaylord established Notan Press in 1990. The name of the press is taken from the Japanese design principle based on the interaction of dark (no) and light (tan). "I first encountered the concept in a design class with Brenda Lowen- Siegel," she explains. "I was intrigued. I came to see the world in terms of notan when I took a weekend workshop with artist/calligrapher Jenny Groat. For Jenny, notan extended beyond the page and into life. From her experience with Zen Buddhism and Jungian analysis, she saw notan as more than a design principle; it spoke to her of the importance of acknowledging and balancing light and dark, positive and negative, in all aspects of life. 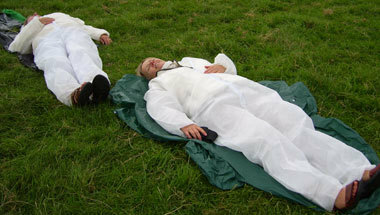 The workshop with Jenny occurred in the year that had brought the death of my mother and the birth of my first child. Her ideas touched me deeply and I, too, came to embrace this view." To see more of this amazing artist's work, visit the Susan Kapuscinski Gaylord website.